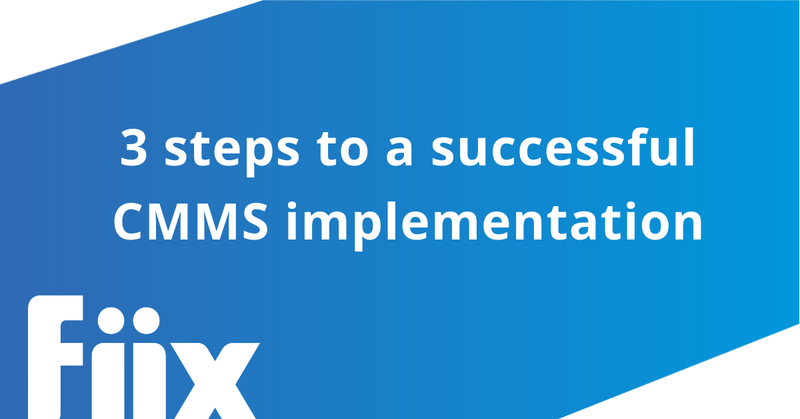 As we explored recently on the Fiix blog, CMMS implementations can sometimes go off the rails, even with the best intentions. According to John Cray of Life Cycle Engineering (writing for IndustryWeek), implementation failures often come down to a culture problem. Thankfully, there are a number of guiding principles that management can put in place to ensure the work culture supports the adoption of a CMMS. But outside creating a culture that accepts new technology, what can you do to set your CMMS implementation up for success? We spoke with one of our resident CMMS implementation experts Leah Perez, who let us in on the blind spots that can stand in the way of a successful CMMS implementation. She also told us how the implementation team at Fiix works to ensure they’re addressing each potential pain point. This can be a problem during both the initial implementation of the CMMS and in the longer term. During early days, problems will arise if it’s unclear who’s responsible for tracking deliverables such as data collection and cleansing to ensure correct setup. Further down the road, there may be a lack of clarity about who on the maintenance team is responsible for ongoing updates in various modules of the CMMS, such as adding work orders, adding parts to track inventory, generating reports, and more. Perhaps all the necessary stakeholders are aware that they need to use the new CMMS. But do they know why? If no one is aware of the goals the organization is trying to achieve by introducing a CMMS, it will be very difficult to ensure that the adoption is carried out successfully. The successful rollout of any new project or system is dependent on the engagement of each stakeholder that will be impacted by new processes. Often, parties that will be involved in the day-to-day management of the CMMS are not made aware of the project plan until implementation has already begun. This can be confusing and frustrating for the very people that need to be well-informed and confident in the new software in order for everything to run smoothly. Perez also shared with us the measures her team at Fiix takes to set maintenance teams up for success during the implementation stage and beyond. During the project discovery phase, Perez helps maintenance teams scope out who the business stakeholders will be. She also guides teams through determining exactly what each stakeholder’s involvement will be with regards to the day-to-day management of the CMMS. This ensures that all roles and responsibilities are accounted for and well-defined, leaving no room for ambiguity. During project discovery and throughout implementation, Perez and her team will develop a project plan that defines the CMMS goals and facilitates the collection and measurement of specific data points that are outlined in the goals. She will also share best practices among other Fiix customers around CMMS setup and usage, as well as common industry goals to help the business outline what CMMS success will look like for them. Perez and her team will often schedule kickoff calls during the project discovery phase with all stakeholders included, so that everyone involved has the opportunity to ask questions and provide feedback. Once implementation begins, her team will ensure check-in calls are set up so that feedback and further questions can be addressed and shape the project plan further, if needed. These calls ensure that everyone has all the information they need, even before implementation begins. Beyond implementation: How can maintenance teams address problems later on? When problems arise after the implementation phase, it’s important to identify where the problem lies. Is it that the maintenance team doesn’t have the manpower necessary to achieve the goals they laid out during implementation? Are there users who are still resistant to using the CMMS? If so, why? Are there constraints outside of the CMMS that need to be addressed in order for everything to get back on track? Professional services: Fiix offers a Post-Implementation Audit program that offers expertise and guidance well beyond the implementation phase. This allows potential issues to be identified and stamped out before they have time to become real problems. The audit may identify growth opportunities that may not have been identified during the initial implementation. Dedicated, value-driven customer support: Fiix offers a Help Centre where customers can browse training articles and videos to learn how to set up and use their CMMS. There is also dedicated support available for any technical issues that are encountered. Customer-specific account management: At Fiix, each customer is appointed a dedicated Customer Success Manager as a first line of contact for all account-related inquiries. This ensures that no problem slips through the cracks and that a relationship is established where a customer’s success manager understands the unique needs of that customer and their team. As with any organizational change that impacts processes and day-to-day operations, implementing a CMMS correctly requires a great deal of planning, attention, and follow-through. It’s important to choose a CMMS provider that will equip you with the support you need to get you through implementation and beyond. Looking to learn more about CMMS implementation? Download our free implementation guide.